With friends in powerful places, the Jaggi Vasudev-led Isha Foundation has been able to get away with allegations of land grab and illegal construction. A frail woman stood up on the dais. Muthamma, an Irula tribal from Coimbatore district, is less than 50 years old, but the hard labour she has been doing since her childhood has etched deep lines on her face. When she spoke, her voice, her demeanour and every inch of her slight body reflected nothing by the strength of her will and her indomnitable spirit. Muthamma was being felicitated by the 15th Conference of the Tamil Nadu All India Democratic Women’s Association (AIDWA), held in Dharmapuri on September 24. She was being honoured for the struggle she had waged for the last several years. She told the delegates the story of that struggle, the happy ending of which is still a distant dream. Muthamma lived with her husband in the forested and hilly tribal areas surrounding Coimbatore. About 20 years ago, she and her husband started working for a yoga ashram in the area as a daily labourer. Subsequently, she had three children – two sons, now 24 and 19 years old, and a daughter who is 20. They have also been working in the ashram since their childhood and continue to do so today, as does her husband. Muthamma says that those that get work sporadically earn between Rs 250 and Rs 300 daily, while those doing regular work earn about Rs 130-150 a day. Muthamma herself stopped working at the ashram when she joined one of 18 self-help groups (SHGs) set up by a local NGO about ten years ago. She remembers that when she left, she was earning Rs 15 a day. As a member of the SHG, she along with her partners would go into the forests to collect medicinal and edible herbs and fruits like amla, shikakai, vadamanga (small mangoes used in pickle) and also different kinds of grass used to feed animals, thatch roofs and for medicine-production. The SHG collapsed after a few years when its members were told that they would have to ask for tenders to have access to the forest produce and this was beyond their means. During this period, the ashram started fencing off the area and blocked their path into the forest. They went to the ashram authorities and begged them to leave a three-foot gap in the fence, but their request was curtly turned down, Muthamma said. As a result, they had to take a much longer route into the forest. This route continued to be used after the collapse of the SHGs, but even this came to an end when the authorities started preventing them from doing this ‘illegal’ work. The ashram stepped in and started using Muthamma and others like her to accompany its members into the forest to share their inherited knowledge of medicinal plants. Once this knowledge was transferred, they were abandoned and, since they were ‘illegal trespassers, it was the ashram members, armed with the traditional tribal knowledge that they had accessed in an underhand way, who were given access to the forest and its bounty. Muthamma then had to resort to daily work on land and orchards in the area. She had a vague memory that during the Bhoodan movement, a big landlord of the area, Muthuswamy Gownder, had donated 44 acres of his land to 13 tribal families who worked for him. They had received ‘pattas’ for this land in 1988 but had never actually been given physical possession. Muthamma’s husband’s grandfather was one of the 13 to receive the patta. Illiteracy and grinding poverty not only prevented the tribals from physically taking possession of the land, it even erased the knowledge of having been given these pattas. The pieces of frayed paper in their possession became feeble reminders of old promises that had failed to translate into tangible realities. In 2012, a fellow tribal took her to attend the Tamil Nadu State Conference of the Adivasi Rights Organisation in Tiruvanamalai. For Muthamma, the conference was a new and stirring experience. The slogans that were shouted enthusiastically and the stories of struggles that were shared made her feel that perhaps the frayed pieces of paper could be of some use. She asked a sympathetic delegate to write a letter to the presidium in her name in which she mentioned some of her problems and asked for help. 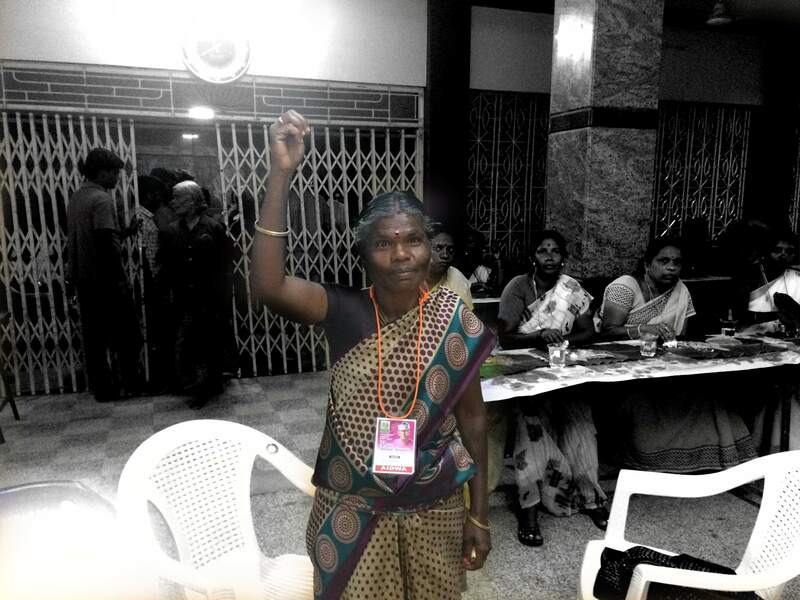 The presidium members, in turn, introduced her to AIDWA members in Coimbatore and the district unit of the CPI(M). Then started her struggle for the land that rightfully belonged to about 200 tribal families like her own. This struggle, however, exacted a heavy toll. Muthamma’s husband and children were still working for the ashram that was claiming this land as its own, that had already taken over hundreds of acres of land in the area. Fear of losing their jobs and fear of a very powerful enemy made them throw her out of her own home. She was forced to take shelter with the headman of her tribe and his family. Along with the nearly 200 tribal families, Muthamma and their newly-found allies put in an RTI application and gained copies of the documents connected with the 44 acres of land. They then approached the district administration to allot the land to them for house sites, which they needed desperately. Earlier this year, Muthamma along with other tribals and activists of AIDWA, Dalit organisations, CPI(M) and also environmentalists, staged a protest on the 44 acres of land. They carried flags of different colours in their hands and planted them on the land in a symbolic assertion of their rights. Meanwhile, the ashram administration had also started fencing this plot of land. The district administration then put a board in front of the land proclaiming that it was government land and that trespassers should keep away. The ashram in turn went to court and obtained a stay which prevents anyone from occupying the land. The tribals are not alone in the struggle against the activities of the ashram. The Vellingiri Hill Tribal Protection Society filed a PIL in the Madras high court in March against the unauthorised structures that have been constructed on the wetlands at Ikkarai Poluvampatti by the ashram. But the ashram has powerful friends. It is owned by the Isha Foundation headed by Jaggi Vasudev, who is now as much in the news as any of his fellow celebrity ‘holy men’. Just a few days before the March PIL was filed, the prime minister himself unveiled a 112-foot-high bust of the ‘Adi Yogi’ Shiva at the ashram – despite being requested by environmental activists not to be present at an occasion when a new violation of building norms was added to a long list of earlier violations. These include a violation of norms governing man-animal conflict areas. The Isha Foundation has been accused in an application pending before the southern bench of the National Green Tribunal of having disturbed the elephant corridor in the area. This has not only affected the elephants but has threatened the lives and property of poor villagers whose villages are now used as pathways by the elephants. The foundation has also received notices in the past from the administration about various structures that it has built without requisite permissions. A retired judge of the high court D. Hariparanthaman added his voice to that of the activists and wrote an open letter to the prime minister requesting him to refrain from attending the programme. He said, “In spite of the Tamil Nadu government’s own submission that there were illegal constructions, not a single building was demolished by the concerned authorities till this date. There are four writ petitions pending in the high court and it’s sad that the cases could not move an inch forward even after three years of their filing. The visit of the prime minister will send a wrong signal and award legitimacy to these illegally constructed buildings. Hence we request [him] not to visit Isha Foundation…the construction of huge illegal buildings will affect the flora and fauna of that area and also pollute the Noyyal river. The pollution of this river will have a cascading effect in the entire western region of Tamil Nadu”. But nothing deterred the prime minister from visiting the ashram and being present at the unveiling of the massive statue – for the installation of which, of course, no permission had been taken. The evening before the prime minister’s visit, Muthumma’s hut received unusual visitors. An inspector of police accompanied by a sub inspector and four constables arrived to inform her that she would not be allowed to leave her hut until the prime minister left. Muthamma was planning to go to Coimbatore city the following day to participate in the black flag demonstration that AIDWA was organising against the prime minister’s visit, but she had no choice but to accept this completely unwarranted and illegal house arrest to which she was subjected. The next day, in order to avoid the black flag protest, the prime minister travelled to the ashram by helicopter. He could not, however, avoid seeing the black balloons of protest that the AIDWA activists sent up into the sky. Of course there was no mention of the problems of the Adivasis at the grand function over which he presided. The Isha Foundation has denied that it has grabbed any land, forest or otherwise. Its spokesman did accept, however, that some “temporary structures were constructed for the Mahashivaratri celebrations” which would be dismantled after the celebrations were over. This has not been done. Now the Foundation spokespeople say that this was delayed by heavy rains and that dismantling will take place once they subside. The PIL was filed in the high court after the prime minister’s visit. In the counter-affidavit filed by the deputy director of town and country planning, Coimbatore region, it was alleged that the Foundation had built structures spread across alarming plinth area without permission. The counter-affidavit also mentioned that it had asked the Foundation to submit details of the purpose for which the Shiva statue (unveiled by the prime minister) had been established along with other buildings and asked for the plans submitted to obtain permission from Hill Area Conservation Authority. The foundation has not responded. In fact, it was revealed at the time of the PIL that the foundation had been served with a “locking, and sealing and demolition notice as far back as December 21, 2012 … directing them to demolish within 30 days from the date of receipt of this notice all the religious buildings and other buildings within the campus in survey numbers 48/1, 48/2, 49, 50 etc at Ikkarai Pooluvampatthy village and restore the land to its original condition”. Hearings are proceeding at a snail’s pace, and cases and complaints are piling up. A whiff of scandal about mysterious happenings and accidents in and around the ashram is also in the air. Meanwhile, Jaggi Vasudev himself has become more visible than ever in the national media. He is traversing the country meeting with chief ministers, purportedly to save rivers. The proposals he is putting forward have been examined and found wanting by reputed scientists and environmentalists. 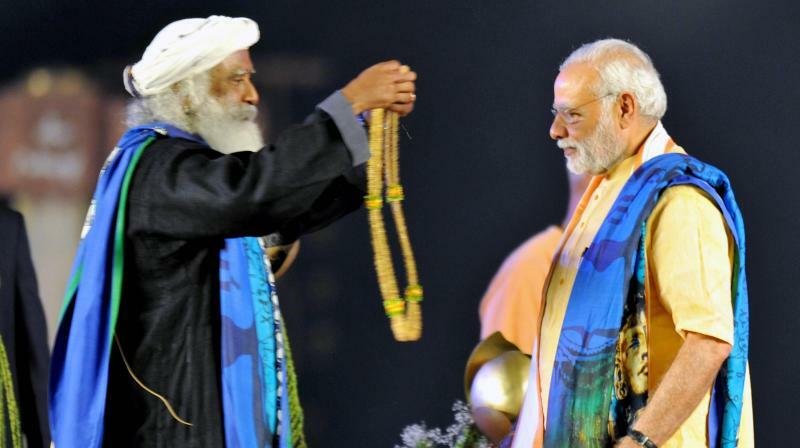 But, with the support of none other than the prime minister and many others among the rich and the powerful, he is certainly the flavour of the month as far as those longing for an ‘untainted’ spiritual guru are concerned. For them, Muthamma and villagers living in the vicinity of the ashram are of little interest. In an interview with the Indian Express, Jaggi Vasudev described himself as someone who could do anything that came naturally to him, including ‘dancing with a beggar’. In the same interview, he said that just like kings of yore, present-day rulers also needed to have spiritual gurus who would keep them on the right path. He made no secret of the fact that he saw himself as well-suited to play this role. Not everyone who knows about the activities of the Isha Foundation would agree. In fact, while they reject his having ever having interacted with poor tribals let alone dancing with beggars, they view his projection of himself as a rajguru with much suspicion and dread. Meanwhile, Muthamma, unheard and unseen, continues to tread the thorny path of struggle that she has chosen. She was determined to attend the AIDWA conference in Dharmapuri. She had been told that she would have to pay for her fare and also the delegate fees. She thought she would be able to save enough from her meagre wages for these expenses, but for nearly a month before the conference, the rain just did not stop. It poured down in front of the hut that she shares with another family, a hut that does not even have a door. In order to get some respite from the rain and wind, Muthamma ties old sarees to the bamboos on either side of the opening of the hut. When asked her what she ate during days of enforced idleness, she said that AIDWA activists in Coimbatore regularly collected rice and distributed it in her area. When there is no work, she boils the rice with greens that grow around her hut, seasons the porridge-like mixture with salt and eats it twice a day. Just five days before the conference, the downpour diminished and she got work for Rs 50 a day. With the precious Rs 250 tied in a knot of her saree, she went to Coimbatore. There, she was told that she was to be a guest of the conference and would be publicly honoured. Her fare and delegate fees would be taken care of by the organisation. Words of courage and wisdom. 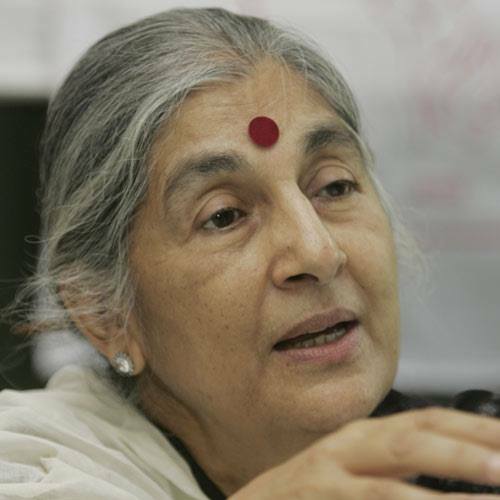 Subhashini Ali is a former member of parliament from Kanpur and politburo member of the Communist Party of India (Marxist).